There has been quite a bit of chatter on the BoardGameGeek forum about the boardgames that appeared in many branches of The Works last week. Some speculated that the number of copies in each branch probably meant they’d acquired a few pallets of games, others wondered if it was a one off or regular event. One BGG member managed to find out the buyer for The Works and got people to send positive feedback. Laura Lemmon, the buyer concerned, has sent out an email to those who contacted her about more boardgames to come! Thank you to you all for your positive responses to our recent trial of Strategy games here at The Works. I am now fully acquainted with the board game geek website, and thank you all for your information! We value your feedback greatly in order to buy the best possible ranges for our customers and as a result I have some news that will excite you! The names below are all new and popular strategy games that we have bought to be delivered into our warehouse next week so they should hit stores in the next two weeks. If, however, you are unable to find any at your local Works please have a look at our website. This list obviously includes the games that have already appeared, and on the whole sold out, in stores already, but it does contain a more and mean that its a good time to stock up on cheap games for presents etc. The beauty of this is that there may be some games that you’ve liked the sound of but didn’t think it was worth a punt on spending 20-odd or 30-odd quid on, but at eight quid you can’t go wrong. Well, you probably should be aware that all though there are a few gems there (like those that sold out on the day they hit the shelf) there are lots of less well known games, that have lower ranking on the geek, but that doesn’t make them bad games, just less popular. I shall be buying several, as even if you only play them very occasionally, or just a few times you can’t say you overpaid for them. If there are games on that list that you haven’t heard of then maybe its time to visit BoardGameGeek and type them in the search area? A boardgame about the Canary Islands? Ooo sounds intriguing, and as a gamer who does holiday there, I was intrigued as to whether it would possibly make an apt travel game? After all it can be fun playing boardgames in their themed locations: Carcassonne, Alhambra, and Puerto Rico are games that people have done (see boardgamegeek for photographic evidence). Islas Canarias is a game about the settlement of the Canary Islands – each player takes one island playing board, which are differently shaped but containing the same number of land plot spaces. The boards each contain a set of features adjacent to the landplots: mountain, coast, river, road, village, and a farm, which vary in the number of plots adjacent to it (so an island will have 5 spaces next to one feature and other islands will have 4 or 3), with each island being strong at something. new players seem to want the bigger islands or moan if they’ve got a small island, but each has its strengths. Look at the islands and you will see each has 5 spaces next to 2 features, 4 next to another 2, and 3 next to the final 2. There is a deck of settler cards, of which each player starts with a hand of five. Each card depicts a settler with their occupation in Spanish and depicting the colour house they want to live in and a priority preference of where they want to live. 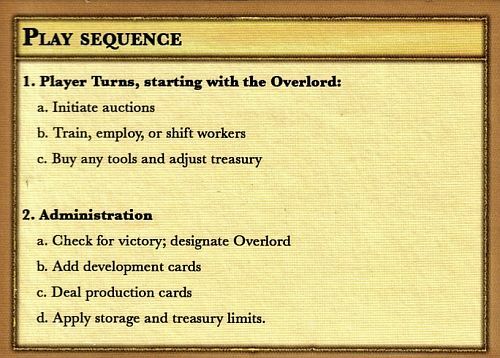 On your turn you can do one of two things and then compulsory do a final action – you can either play a settler card to place a house on your island (of the colour stated on the card, and its placed according to the priority depicted on the card e.g. next to the mountain, if there’s no free space there then next to a red house, otherwise …) or pick up three cards; the final action of your turn is to place a card on the settlement ship (so if you start your turn with one card you must choose to pick up to be able to place a card in the ship). At the end of each round the cards placed on the ship by everyone are shuffled and one placed aside (so the card you put in may not come out this time), they are then “settled” according to the priority i.e. given to the player who has most free spaces next to the settlers priority, with ties going down to the next order of priority. Of course you have to place the settler in a highest available space, so meaning you now have less spaces. Your spaces this way can quickly fill, luckily there is a way to free up spaces. Houses are worth 1 point, but if you have 2 houses in the same colour you can exchange these for 1 palace (that has to go on one of the spaces vacated by the houses) worth 3 points (or 2 points if you already have 1 in that colour). You can also upgrade to Town settlements, worth 5 points, by converting 3 houses of that colour. A rule I missed on first couple of plays is you cannot upgrade a palace and a house into a town, which is quite important as it makes you more vulnerable to pirates in the meantime! The settler deck consists of 54 settlers and 6 pirates (one in each colour). A player may not play a pirate on their island, but can place it in the ship. When a pirate comes out they attack the owner of that colours privilege, who then has to place a house (of any colour) back into supply (if they have the pirate protection privilege they can determine another player to be attacked). If the privilege isn’t out its the player with most points in that colour with ties meaning all tied players put one house back. The game carries on until one player reaches 19 points and then the game ends at the end of that round (so it is possible for someone else to win with more points or even the player who reached 19 to then lose points via the pirates!). This game was described to me by one friend as just a puzzle solving game, but I don’t see it that way. It is about being aware of which features you are strong in each round (to hopefully get settlers via the ship) and deciding when to upgrade to palaces or go for towns. It is quite a short game, playing in about 45 minutes, though this can be longer if players are deliberating far too much each turn. The mechanics are quite simple to pick up but with more to it than a quick filler. Maybe I will take it on holiday next time. Would you financially support a website? I’d like to share a worry and concern of mine that I’ve had for a while that I’ve not, until today, done anything about! The concern is what would I do without a web community that I was involved with, or would I be willing to act to prevent its demise – and if so would I need to wait until its imminent demise to act? I have been involved in board game internet communities for a long time, in fact I was playing Diplomacy electronically before the World Wide Web came into being! Over the years my board gaming interests have widened and so has the websites I’ve been involved with. I have experienced the rise and fall of many websites, some because the main organisers have lost interest others because the financial burden has been too much. As an end user its not apparent there are costs and the like for that website you depend on, and by the time you find out about difficulties its often too late and people have decided to close down. I am an avid fan of BoardGameGeek and it is a great resource. I do participate, by submitting images and files, and activity in posting in forums, as without users being active any community is dead! However I have been an active member of many communities that have gone because the financial burden for the organisers has been too great. By the time organisers tell you of the financial plight, it is usually too late – they’ve decided not to continue, so even if money came forward they’d not continue. So that got me wondering, could I do without the Geek? How many times have I checked for posts on rules queries during games, or printed off player aides before hand? The answer is I couldn’t. I am not suggesting that BoardGameGeek is any financial difficulty or imminently closing down, but I am asking how important is the site and its continuation to you? They have adverts and a donation mechanism, but it is too easy to think they are fine and not do anything until they ask (by which time it’s too late). I have, for the last year at least, thought that whilst I feel I am an active member of the site for 5 years, should I be doing more (specifically financially). I guess the BGG admins must be quite aware of the constraints people have as they have a variety of subscription levels: You can give one off donations, and it you give $15 you get a badge under your username, and if you give $25 you get all the adverts disabled for you; or you can donate monthly if you can afford to support the site that way. So I decided to donate enough for a 2011 badge, partly because it shows some outcome of donating, and partly because I can then talk about it!